An improvised life to the fullest. 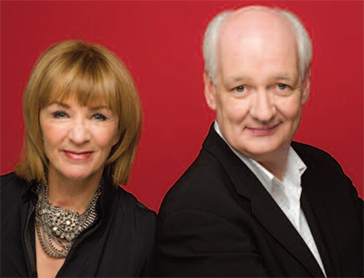 Life and improvisational theatre have much in common as far as Colin Mochrie and Debra McGrath are concerned. “Life is so improvised that sometimes you just have to go with it,” says Colin, who achieved fame on both sides of the Atlantic as one of the stars of the long-running comedy improvisational show Whose Line Is It Anyway? Both forms of theatre can be terrifying, says Colin who played the Fool in the Groundling Theatre Company production of William Shakespeare’s King Lear inToronto in January 2018. 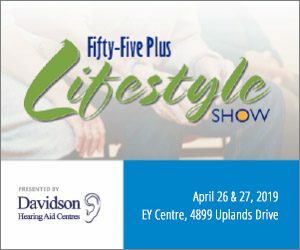 “I have done improv and scripted shows on television and in film and there’s always a challenge,” says Deb, who has starred in such television series as Little Mosque on the Prairie, as well as appearing with her husband in such programs as GettingAlong Famously. “For me, the number one challenge in scripted work is the lines.If you’re thinking all about the lines, you’re not thinking about your character. In improv, you sketch out a character and, if you’re comfortable with it, you don’t dry up,though you might say a lot of loony things.” And saying loony things is what Whose Line Is It Anyway? — originally a British radio show, that later moved to television — is all about. The show is built around a host and four contestants (such performers as Stephen Fry and Hugh Laurie) presenting competing improvisational scenes. “Essentially, the show doesn’t exist till people do the scenes,”explains Colin, noting that because improv and theatre sports were fairly young arts in Great Britain in the 1980s, North American actors were brought over to be part of the show. He and fellow improviser Ryan Stiles, with whom Colin still partners on stage regularly, were two of the imports and continued working with the show for eight years until it ended its U.K.run in 1999. Technically, Colin, who was born in Kilmarnock, Scotland, was not an import. Rather, he was returning to Great Britain for theTV show. His parents, with Colin and his younger brother and sister, immigrated to Canada in 1964, living first near Montreal, Quebec, and then moving to Vancouver, British Columbia.It was at the Studio 58 theatre school, which is part of the professional theatre training program at Langara College in Vancouver, that Colin discovered the joys of theatre sports and began“making a living doing a job that wasn’t a job,”instead of studying to become a marine biologist as had once been his goal. After graduating from Studio 58, he started work with theVancouver Theatre Sports League. He stayed with that company until he moved toToronto to perform with the Second City National Touring Company before becoming part of the British Whose Line Is It Anyway? team. Rooted in improvisational games, the Second City comedy troupe began in Chicago in 1959. Co-founded by Bernie Sahlins, Howard Alk and Paul Sills in a small cabaret theatre, Second City grew into a prolific and very influential comedy empire. Paul Sills was the son of teacher Viola Spolin, the woman who developed improvisational techniques that came to be known as theatre games. The cabaret theatre, comedy style of the Second City tended towards satire and commentary of current social norms and political figures and events. While the style of comedy has changed with time, the format has remained constant. Second City revues feature a mix of semi-improvised and scripted scenes with new material developed during unscripted improv sessions after the second act, where scenes are created based on suggestions from the audience. In 1973, Second City opened a theatre in Toronto. By the mid-1970s, both venues became a source of cast members for Saturday Night Live and SCTV, which borrowed many of the writing and performing techniques pioneered by Second City and other improv groups. Second City Television (SCTV), which ran from 1976 to 1984, was a Canadian television sketch comedy offshoot from theToronto Second City. Toronto’s Second City main stage troupe has won numerous Canadian Comedy Awards since its founding. The Second City Training Centre was founded in the mid1980s to facilitate the growing demand for workshops and instruction from the world-famous Second City theatre.Training centres are located in Chicago,Toronto and Los Angeles. Famous alumni of Toronto’s Second City include: Dan Aykroyd, John Candy,Gilda Radner, Martin Short and, of course, Debra McGrath and Colin Mochre. 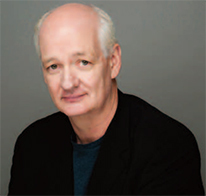 Colin’s long-time association with Whose Line in the U.K. continued when the show was adapted for North American television, running from 1998 to 2007, with Drew Carey as its host.Through those nine years, Colin appeared in every episode.The show was revived in 2013 with host Aisha Tyler at the helm and Colin is still involved. (“The show is a vampire. You can’t kill it,” jokes the award-winning improvisational comedian, who was named Canadian Comedy Person of the Year at the 2013 Canadian Comedy Awards.) Colin’s big breakthrough on Whose Line must have come as something of a relief to Debra, who first met him in 1988, when, as part of Second City in Toronto,she hired him to be part of the comedy troupe. “There was a moment when I thought ‘Oh God, I’m falling in love with an improviser. I won’t have a pot to pee in,’” she recalls with a laugh. “Then he had one of those lucky breaks in his career. There are many people with lots of talent and ability, but you also have to be in the right place at the right time. From there on, other than two dark years called menopause, it’s really been smooth sailing. In 1990, the couple’s only child, Luke, was born. In 2015, Luke told his parents that he was going to transition into the woman that she is now. Studio 58 was founded in 1965 as a small theatre arts course, first held on the King Edward Campus of Vancouver City College (now Vancouver Community College). By 1970, it had grown into a full program and moved to new facilities at Langara College. Studio 58 is the professional theatre-training segment of Langara College’s theatre arts program. The name, Studio 58, is the room number of the original theatre space. The school offers a three-year program for acting students and a two-year program for production students. A Bachelor of Fine Arts is offered with an additional year of study through a partnership with Capilano University. It is one of the top theatre schools in Canada and the only conservatory style theatre-training program in Western Canada. The school auditions hundreds of people across Canada, but only 16 students are accepted per semester. The school has around 72 students for both its three-year acting program and two-year production program. Studio 58 operates a small theatre and presents four full-length productions annually. It also presents a smaller student-created show in a separate space. “The three of us have been a very close unit from the beginning and she was always very open with us when she was growing up,” says Colin. “Kinley was not a woman trapped in a man’s body,” says Deb. “She says she was happy as Luke as a young boy, until she wasn’t. Kinley’s transition has underlined to her parents “how outstandingly unimportant gender is, especially in this generation when pioneers are finally coming out as who they are rather than spending a lifetime hiding in the shadows and living unauthentic lives,”says Deb. “As a human being who hopefully learns every day, I wouldn’t have missed this experience for the world, because it educated me about any prejudice I might not have known I had.” She recognizes that some parents might have greater difficulty accepting that their child is transgender, but she says,“I just don’t understand how anyone can reject their child.The exact same human being is standing in front of you. The three have appeared on stage together, most recently hosting a fundraiser for the Rainbow Camp (a place for people who are lesbian, gay, bisexual, transgender, queer or questioning to connect).